Delight in the original Peach Melba recipe, as translated from Escoffier's words. Learn the fascinating history of this Summer treat with Tori Avey's full story in The History Kitchen. Boil a medium pot of water. Keep a large bowl of ice water close by. Gently place a peach into the boiling water. Let the peach simmer for 15-20 seconds, making sure all surfaces of the peach are submerged. Remove the peach from the boiling water with a slotted spoon and immediately plunge it into the ice water for a few seconds to cool. Take the peach out of the ice water and place it on a plate. Repeat the process for the remaining peaches. When all of the peaches have been submerged, peel them. Their skin should come off easily if they are ripe, thanks to the short boiling process. Discard the skins. Halve the peeled peaches and discard the pits. Optional Step: Place the peeled peaches in a large bowl of cold water mixed with 1 tbsp fresh lemon juice or ascorbic acid powder. Let the peach halves soak for 10 minutes. Drain off the water and gently pat the peach halves dry with a paper towel. This step will help to keep the peaches from oxidizing and turning brown. Sprinkle the peach halves with sugar on all exposed surfaces. Place them on a plate in a single layer, then place them in the refrigerator for 1 hour to chill. Meanwhile, make the raspberry purée. Place the raspberries into a blender and pulse for a few seconds to create a purée. Strain purée into a bowl through a fine-mesh sieve, pressing down on the solid ingredients and agitating the mixture with a metal spoon to extract as much syrupy juice as possible. It will take a few minutes to extract all of the juice from the solids. When finished, you should only have seeds and a bit of pulp left in the strainer. Dispose of the solids. Sift the powdered sugar into the raspberry purée, adding a little powdered sugar at a time, and whisking in stages till the sugar is fully incorporated into the syrup. It will take several minutes of vigorous whisking to fully integrate the powdered sugar into the syrup. Refrigerate the raspberry syrup for 1 hour, or until chilled. Assemble six serving dishes. Scoop ½ cup of vanilla ice cream into each serving dish. Place two of the sugared peach halves on top of each serving of ice cream. 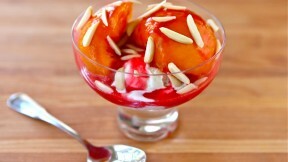 Divide the raspberry sauce between the six dishes, drizzling the sauce over the top of the peaches and ice cream. Top each serving with a tablespoon of raw almond slivers, if desired. Serve immediately.